(Open Box) Markbass' top-selling bass preamp and a quality Markbass custom woofer combine for exceptional power and pop. The Markbass CMD 121H is a bass combo amplifier that delivers incredible, professional-quality sound in a compact, easy-to-manage package. Less than 2' wide or tall, and under 40 pounds, the CMD 121H provides an amazingly large amount of power with its 12" Markbass custom woofer with a 1" compression driver with custom horn. This is due in part to the excellent design of the speaker, and the way the cabinet was built to protect the integrity of your sound. But the CMD121H amps's sound is also increased by the built-in presence of the Little Mark II solid state preamp. 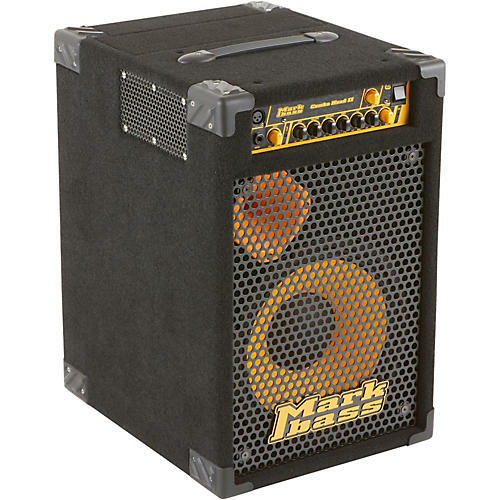 It gives you a 4-band EQ, Markbass' own VLE (Vintage Loudspeaker Emulator) and VPF (Variable Pre-shape Filter) filters, and the ability to hook up to an extension cab for even more room-filling sound. Voltage is factory preset for the U.S.